Gary Joyce is a literary gift to the sports world. He is just a marvelous writer, able to paint beautiful imagery with his keyboard. And hockey fans should count themselves as very lucky that Joyce accidentally became a hockey writer. That's one the earliest of revelations in his new book Future Greats and Heartbreaks: a Season Undercover in the Secret World of NHL Scouts . He also reveals a life long passion of studying and analyzing sports drafts, a passion that many fans share. For some fans it is all about hope. Hope of what is to come. For others, like Joyce, it is about academics, which in the sports world doesn't always have a place. To further educate himself and his readers, Joyce sets out to explore the tightly locked hidden world of talent scouting. He is in search of the theory behind scouting, looking for trends as surely there must be some careful strategy when handing out million dollar contracts to junior players and college kids. Frankly, there isn't. Apparently. The author concludes "There was no unified theory, no logic." In that sense, I felt what the author must have ultimately felt - disappointment. Not disappointment in the book, as it is a gem by Doubleday Canada and worthy of your purchasing consideration. No, the disappointment lies in the scouting institution. I think Joyce, like myself and probably many other fans, entered into this book with some assumptions about the depth scouts go to dig information on the players. Sure, we all know they dissect their on ice performance to no end, but I always figured what separates the best drafting teams from the worst drafting teams was the in depth background checks, personality analysis, parental and other outside influences, and any last circumstance that might affect their play and their development. When ranking 100s of players on a draft list, I figured it was the human intangibles that more often than not separated players of equal value. Or at least that is the way it was with Doug MacLean's Columbus Blue Jackets organization, the only team that would grant the journalist mostly unfettered access to the scouts, the meetings and the war room for the 2006 and 2007 NHL draft. The Jackets were a notoriously poor drafting team under MacLean, and when I read it was Columbus who Joyce was shadowing, a warning flag immediately shot up for me. And I think I was right. You almost hope Joyce's findings were skewed by this poor organization. In all likelihood any skewing is not terribly significant, given the NHL's crap shoot history at the draft, but it sure would be interesting to see how Detroit or Ottawa does things in comparison. Joyce looks at what life is like to be an unheralded scout - low pay, constant travel, terrible motel rooms and no thanks. He also exposes it as surprisingly political, and, not surprisingly, old school. He then tries to use his journalism training to scout player, with the intent of comparing his findings with that of the traditional bird dogs. I think Joyce's look at the scouting world has the potential to let that old school scouting world look at itself and it's archaic ways. I'm almost shocked at the lack of off-ice background work done by the scouts. In many ways the trained journalist was able to see more than the scouts. Not that that helped matters in the end, though. Joyce was not high on Phil Kessel, based largely on character. It is still early, but Kessel is now proving his detractors all wrong in Boston. Joyce also gives us some interesting and personal looks into the lives of prospects like Angelo Esposito and Akim Aliu, and his own thoughts on many, many other prospects. By doing so he lets his readers get a hint of what it must be like to on the opposite end of the scouting spectrum: to be the player everyone is tearing apart. After reading this book, the draft will remain about hope for me. But I'm not certain it is about academics now, if it ever was. Perhaps the best drafting teams have already figured that out and corrected it. Though many of the mysteries of NHL scouting remain unsolved (or perhaps unsolvable?) 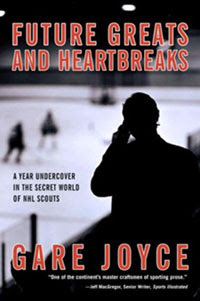 Gare Joyce's Future Greats and Heartbreaks: a Season Undercover in the Secret World of NHL Scouts is an excellent hockey book. Check it out today at your local bookseller. Win A Copy Of This Book! Hockey Book Reviews.com in conjunction with Double Day/Random House publishing is giving away 2 signed copies of this book. All you have to do is tell me two other hockey books published by Double Day/Random House in 2007. Here's a good place to look. Then email your answers and to hockeybookcontest@hotmail.com. A draw from all correct answers will take place on December 1st, 2007! Also See: Gare Joyce is once again trying his hand at blogging, offering http://scoutshonourbygarejoyce.blogspot.com/ as a post script of the book. Who knows, over time it may be just the beginning of the next chapter.